Final Fantasy 15 Patch 1.03 is live starting December 21st, 2016 and includes the promised free Holiday Pack content update. It is 3.2 GB heavy for both consoles, but some players reported a larger patch of 11 GB, which might include additional content for the Gladio DLC that will be available in January. If you have slow Internet, be sure to download it before tomorrow. There isn’t much you can find out from the patch notes. The main focus is on the New Game + and the additional bonus content. 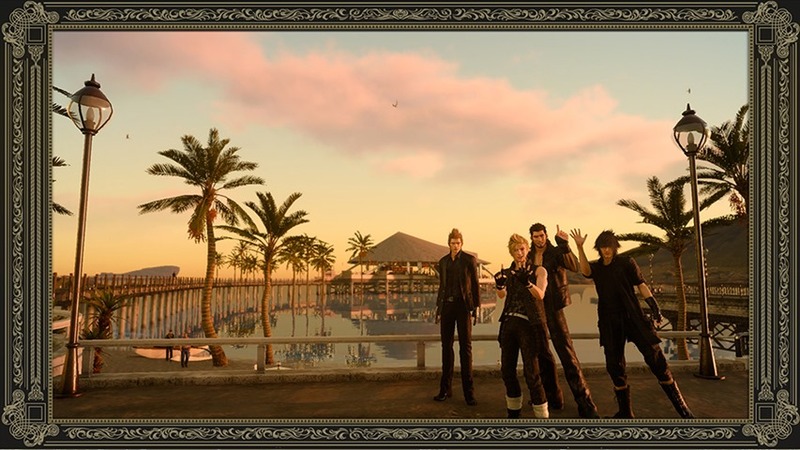 Included in the bonus content are new picture frames for Prompto’s shots. The extent of the bug fixes remains unknown, but the weight of the patch may reveal that there are quite a few. The holiday pack may also be included, although it won’t be available until tomorrow. Check out our guide Holiday Pack Plus – How to get free DLC. You can now sell the upgradeable weapons. Warrior’s Fanfare – An item that gives you more AP for getting an A+ in offense after combat. Nixperience Band – An accessory that stops your XP from tallying, making the game more difficult. Carnival Passport – A ticket that grants entry to the carnival that will take place in late January. Choco-Mog Tee – A t-shirt with a moogle and a chocobo, available at the carnival (during late January). Various Bug Fixes haven’t fixed the Aranea glitch, where she remains with your party. You can actually start a New Game + with Aranea by your side. Sure, she doesn’t push the car at the start, but it is funny to see her in these new moments. Check How to get Aranea as a permanent Party Member. The holiday pack is set to start tomorrow. Among many other things you can hope for, the best ones are probably the ones included in the premium Holiday Pack + DLC like new outfits, the Ring of Resistance (an accessory that turns off friendly fire when casting spells), the Stamina Badge (an accessory for Noctis that allows him to sprint forever), the Key of Prosperity (an accessory that increases the drop rate of valuable items) and much more. You can see it all in our Holiday Pack content update guide. You can start the New Game + from the main menu. Almost everything you’ve earned in your previous playthrough will remain in your inventory. All ascension points, experience levels, outfits, inventory items… The two items you can’t expect to be there are the upgraded versions of the Engine Blade and Flying Regalia Type-F. It seems that the enemies are not scaled with the New Game +. Normal and easy difficulty also remains unchanged, and there is no hard mode. If you are a high enough level from the previous playthrough, they will be more of a nuisance than anything else. NG+ gives you ability to get duplicates of unique top tier accessories and weapons. You’ll be also able to get 14 more magic flasks. If you want to know what does / doesn’t carry over into New Game + take a look at our comprehensive list – Final Fantasy 15 New Game + Patch Information. Downloaded the new 1.03 patch, but Cid doesn’t take in multiple weapons for upgrade. He is currently upgrading the Auto Crossbow, while I have Force Stealer and Monster Claw still sittting in my inventory. have a question, how do I unlock new game++ and +++ on FFXV?